The U.S. Constitution brought together, in one remarkable document, ideas from many people and several existing documents, including the Articles of Confederation and Declaration of Independence. Those who made significant intellectual contributions to the Constitution are called the "Founding Fathers" of our country. 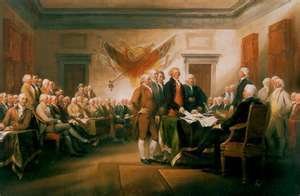 Many of the United States Founding Fathers were at the Constitutional Convention, where the Constitution was hammered out and ratified. George Washington, for example, presided over the Convention. James Madison, also present, wrote the document that formed the model for the Constitution.